Have we no decency as a nation? "Have we no decency as a nation? As we celebrate Martin Luther King, how can any of us, in good conscience, sit idly by while our fellow Americans go to work protecting us and our welfare and do not get paid? As the head of a national coalition of advocates for democracy—whose members represent more than 40 million people—I am urging everyone to pick up the phone and call their Members of Congress this weekend. Tell them you will not tolerate 800,000 hard-working people being held hostage to political brinksmanship between an erratic bully and elected leaders too cowardly to call his bluff. Let us be perfectly clear: the government of this country is us. These are every-day, hard-working people who have devoted their lives to advancing our common good. They inspect our food and our baggage at the airport to keep us safe. They monitor potentially life-threatening storms and inspect chemical plants, factories, and oil refineries, where a single mistake or missed data point could put hundreds or thousands at serious risk. We may not have personally made the decisions to shutter their agencies, but every day that goes by without our Members of Congress hearing our outrage is another day we allow them to be political pawns in a game of Washington tug-of war. Let this be a weekend where elected leaders’ phones start ringing off the hook as constituents fed up with inaction condemn a senseless government shutdown; and let those phones keep ringing until we can get people back to paid work. Please tweet at us at @Unite4Democracy telling us you called and shared this action." TO ACCESS THE TOOLKIT, COURTESY OF AFL-CIO, CLICK HERE. 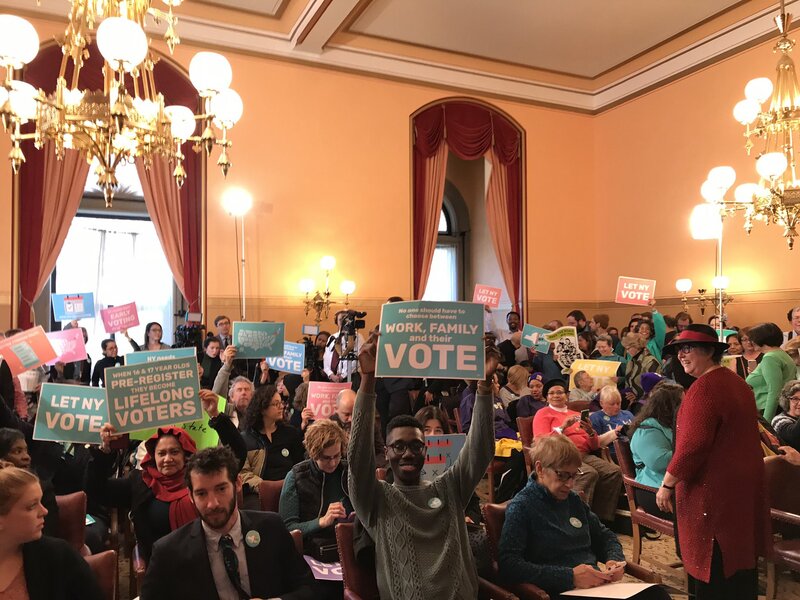 Thanks to the growing demand at the state level for democracy reform, organizers and local communities have put New York on the path to instituting some of the strongest voting laws in the country! Congratulations to the Let NY Vote coalition, DI partners AFL-CIO, Brennan Center for Justice, Common Cause, Daily Kos, Demos, Democracy Matter, NAACP, National Action Network, Public Citizen, SEIU, United Auto Workers, Working Families Party, and all allies who worked on this historic campaign! Last Tuesday, January 15, both houses of the NY Legislature passed a comprehensive package of voting reforms including no-excuse absentee voting, early voting, same-day registration, pre-registration of 16 and 17 year olds, and consolidating state and federal primaries. Now, the campaign needs your help to call Cuomo and tell him to include direct funding for early voting and electronic poll-books in his budget. Yesterday, Janurary 17, Federal Judge James Peterson ruled that the attacks on voting in Wisconsin passed during the December 2018 Lame Duck session were unconstitutional. Congratulations to our partners and coalition allies for defending the people of Wisconsin from the GOP's shameless power grab. Read more here.